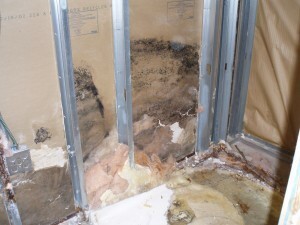 Mold damage oftentimes occurs as a result of water damage, yet mold is a problem that is not so easy to get rid of. Molds are a type of fungi; they are microscopic organisms that, under the right circumstances of moisture and high humidity, can begin to grow and reproduce in your home. Molds can grow on almost any surface and will continue to grow and reproduce by digesting wood, sheet rock, wallpaper, insulation, etc. 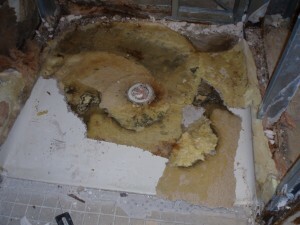 Molds not only have the ability to destroy a home, but they can wreak havoc on your health as well! If the mold spores are disturbed, they can be released into the air. You may breathe them in or ingest the spores. Mold spores can lead to fatigue, runny noses, skin irritation, and may cause serious problems for individuals with mold allergies. All of these smaller symptoms can lead to bigger and more severe problems in the future. Molds are often found near water sources in a home, such as leaky faucets or areas with plumbing leaks. They are most commonly found in rooms with water usage, in laundry rooms, kitchens, and bathrooms. Molds may also be found on cool, humid wall surfaces, especially on inside cold exterior walls in basements or closets. You may smell a “musty” odor or see small black or green spots on your walls and/or ceilings. This is a sign of bigger problems, which you may not be aware of, but that need to be addressed quickly and efficiently! Thomas Cleaning & Restoration can help you solve this problem! We are licensed and insured to safely remove mold from your living space. As always, we work with your insurance company, as well as communicate with you, to quickly and effectively improve the environment in your home or business, whether in Idaho Falls or anywhere in Southeast Idaho.